Taken on our recent Med cruise with our kids. My wife and kids went back to Fira to get on the cruise ship and I stayed back in Oia to enjoy the sunset on my own. What a beautiful shot! I've always wanted to go there. Love the colours and chaos of this shot. The strong blues of the roofs are great sitting below the very red sky. 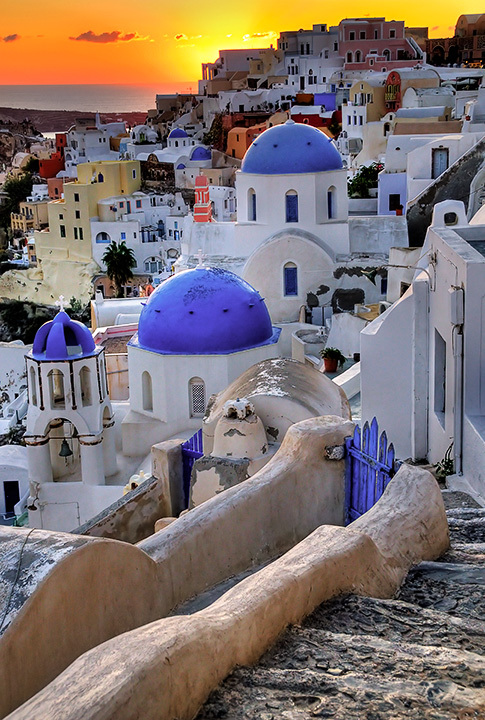 classic Greek image, colors pop! Lots of visual interest. I like the contrast of colors and shapes in this shot. Also I like the transition of coolness in the bottom of the image to the warmer tones in the top (to include the colors of the structures, horizon, and setting sun.) Very nice shot. Proudly hosted by Sargasso Networks. Current Server Time: 04/21/2019 12:47:19 PM EDT.